1.In large bowl, whisk eggs. In blender, blend enchilada sauce, sour cream and cilantro until smooth. 2.In large nonstick skillet, cook chorizo over medium heat 7 to 8 minutes or until cooked through, breaking up meat with side of spoon. With slotted spoon, transfer chorizo to bowl; cover to keep warm. In same skillet with remaining fat, cook bell pepper, jalapeño and onion 4 to 5 minutes or until vegetables are soft, stirring occasionally; transfer to bowl with chorizo and cover to keep warm. 3.Meanwhile, transfer enchilada sauce mixture to large saucepot and heat to simmering over medium heat; remove saucepot from heat. Add chips and toss until well coated; cover to keep warm. 4.In same skillet, melt butter over medium heat. Add eggs and cook 4 to 5 minutes or to desired doneness, stirring occasionally; fold in chorizo-vegetable mixture. 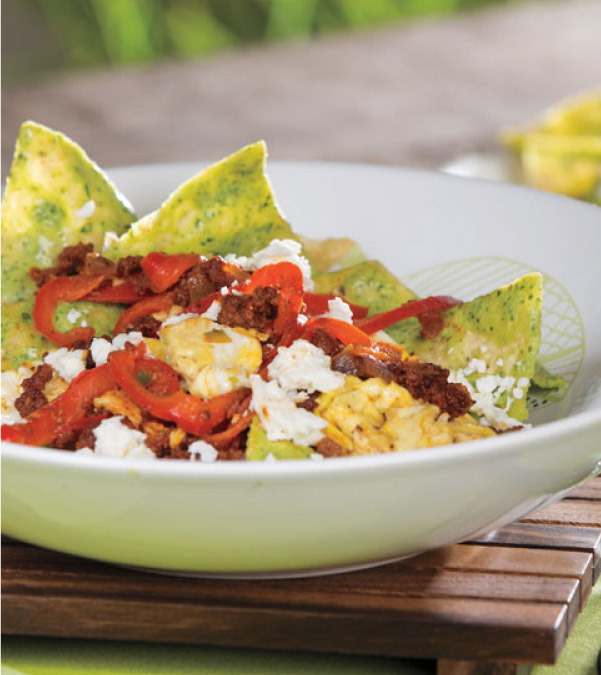 5.To serve, evenly divide tortilla mixture over 6 plates; evenly top with egg mixture and sprinkle with queso freso.